See, one thing that I don’t like about generation ship stories is the very thing that makes them such potent settings for microcosmic analysis: they focus on people just being normal humans inside a giant tin can. There’s crime, people trying to fix stuff, school, romance, etc. It’s all very “this is just our world crammed into a much smaller space with the tension ramped up to 11.” In theory, this is fine, but one thing I wish more of these stories would do is look at just how the human species would change by living in such an environment, and not in a superficial sense of containment and the space being cold and deadly. 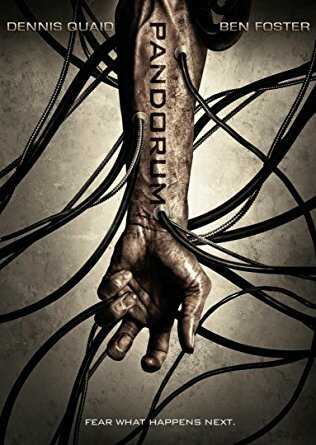 Pandorum does that through the lens of horror. The central premise of the film is actually a trick. As Corporal Bower awakes and recovers from hypersleep, he comes to the realization that something has gone catastrophically wrong on the Elysium. The ship’s reactor is in desperate need of repair and a group of humanoid monsters — and actual human ones — roam the ship looking to murder (and eat) anyone found alive. The film suggests — through Bower’s memory bursts — that these things may not be quite as we’re shown, but it isn’t until the very end that the script flips entirely: the Elysium crash landed in the ocean of Tanis (the destination planet) over 800 years ago, leaving the surviving inhabitants trapped in hypersleep or, for those who have awakened, in various stages of delirium. How much of this is real? We don’t know. Bower’s view of the mutants might be a hallucination, or it might be a manipulation of real violence on the ship. We simply don’t know. What we do know is this: Bower is suffering from a form of deep space psychosis. It’s that treatment of the psychological damage of advanced technology and deep space disaster that fascinates me about the film. What would happen to us if we actually built a ship like the Elysium? Do we have any idea how our minds would stand up to hypersleep or extended travel across vast distances? How would we adapt to life on an alien world, cut off from the rest of human civilization by such a vast distance that even regular communication would be functionally useless? This isn’t a Mars colony we’re talking about. The Mars One project assumes a delay of 3 to 22 minutes for comms. You can almost have conversations that way, but when the delay is 100 years, there’s really no human civilization but the one that you create on the other end. That must have severe psychological ramifications for our species. We must change in response to that level of isolation. While Pandorum certainly sensationalizes the answers to these questions, it does raise the very real problem that deep space might present to us as a species. Those long missions full of so much isolation will surely drive some people over the edge. Whether that means we will turn into rampaging murder beasts or simply more unstable than usual, there will be impacts of these kinds of psychological issues. Generation ships, after all, won’t have the same luxury as a human mission to Mars, where you can be more selective about who you pick to go on the mission. The Elysium is home to 60,000 people, a small number of which are crew — small groups of crew tasked with managing a massive lifeboat with no communication but with themselves and the silence of deep space. That’s a lot more human variation to add into the mix than you would get on a 21st century Mars mission. I want to know what happens to us when we go through this. Maybe the Mars missions to come will offer some answers. But that means we need to start investing in space exploration. One day, we are going to leave this planet, some of us for good. While we still can do this space exploration thing on a whim, we might as well start thinking about who we will become as we venture farther and farther out. The topic of generation ships was suggested by Jeff Xilon on Twitter. Thanks, Jeff!